When we say the word ‘drawing room,’ the only thing that comes to our mind is a room that is well-decorated and cozy enough to entertain the guests. Therefore people are more conscious about their drawing room decoration as compared to that of other rooms. People avail the services of designers to make it possible. But it is a bit expensive. You can decorate your drawing room yourself by following some simple tips and looking for different effective ideas. Some of such tips and ideas are described below for your assistance. Firstly all people think about the color of the drawing room. Different colors render different look to your drawing room. You are likely to use white color in your drawing room if you want your drawing room to look spacious. But for a cozy feeling, brighter and darker colors are proved to be the best like forest green color or chocolate brown color. In my opinion, white color is better than darker colors but it is definitely your choice that which color you want to use in drawing room. Next most important factor is arrangement of furniture. Furniture and other accessories should be arranged in such a way that enough place is left for people to move. All the furniture should be lined up against the walls. Another option to arrange the furniture is to place it in such a way that furniture items face each other in the middle of the drawing room. Separate the furniture in different groups for different purposes like for reading and chat. Remember that the spaces between different groups of furniture should be clear enough so that people can easily move between them. The color of the furniture should also go well with the colors of curtains and cushions. Lighting of drawing room is the most important factor in my opinion. You should use a variety of lights in drawing room like a bright overhead ceiling light should be used at parties and table and floor lamps should be used for homely gatherings. Soft and bright lights should also be installed for conversation and reading respectively. To give a romantic look to your drawing room, use candle lights. The curtains should give an imaginative look to your drawing room. The design and color of the curtains will depend on the color of doors, walls and furniture and other decoration items of the drawing room. As far as the fabric is concerned, the best fabrics for curtains are silk and cotton. For durability, use lining curtains and if you want to make them more attractive then use fancy tiebacks. The most suitable flooring for your drawing room is ceramic tile flooring, wooden flooring or white marble flooring. Ceramic tile flooring is the best as it is easy to keep it clean. It is stain-free and anti-slippery as well. Wooden flooring is long-term and doesn’t get cold in winter and doesn’t get hot in summer season. White marbles are also durable and stain-free and are easy to keep neat and clean. If you are not interested in using wooden flooring, tiles or white marble flooring, you can also use carpet to add the beauty of your drawing room. If you have kids in your house, you should choose a stain opposing carpet. The color of the carpet should also be selected by keeping in mind the color of walls and furniture. 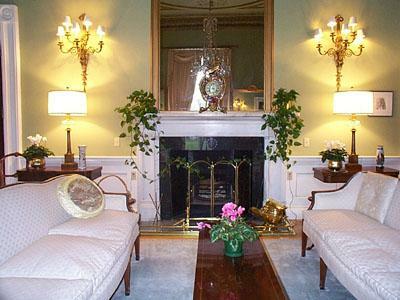 The arrangement of your drawing room items should be flexible so that it can be changed according to the requirements. So you should choose light-weight furniture for your drawing room so that it can be move very easily. These were some ideas related to the decoration of drawing room. I hope you will find them very useful.